Black Diamond Performance have developed three stages of Performance Clutch Kits – Fast Road, Fast Road/Competition and a full Race Paddle Clutch capable of handling and transmitting the torque generated, as well as providing a range of other benefits. Utilising our experience in brake disc technology, all clutches have grooves machined into the pressure plate surface. These grooves help to dissipate the heat generated as well as remove the dust and gases created. Stage 1 - Fast Road clutch kit is recommended for vehicles with up to a 20% increase in torque above standard. 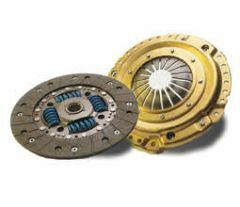 The clutch disc has a spiral woven glass fibre friction material with a heavy copper core. The added copper in this friction material allows the clutch to perform well at even higher temperatures, as well as improving burst strength (approximately 9000 RPM) and helping to dissipate heat through the material. Stage 2 - Fast Road / Competition clutch kit uses an aramid fibre friction material similar to Kevlar and is recommended for vehicles with a torque increase of up to 30%. These clutch kits provide an even stronger clamping pressure than the Stage 1, as well as boasting an even higher burst strength. This is aided by the extreme hardness of the aramid fibre material, which is nevertheless very lightweight. Stage 3 - Full Race clutch kit is recommended for increases in torque of between 30 and 60%. We use a cerametallic friction material, allowing it to be able to cope with extremely high heat and torque. With its very high clamp load and stainless steel backing plates ensures that maximum torque is transmitted from the engine to the wheels on the ground with minimum risk of overheating or slipping. Our stage 3 paddle clutch retains the drive ability required in normal road use, although some changes to driving style are required (more revs to pull away).